Some commonly held beliefs about audience attention spans and social media optimization might be hindering your digital marketing effectiveness. These were among the learnings from Brandwatch’s Now You Know 2017 Conference. Brandwatch is a UK-based social media intelligence company that has helped to pioneer the space of social listening. One of the discussions we found most interesting was from Matt Locke’s presentation, a former BBC and Channel 4 editor and Head of Multiplatform, now at Storythings Ltd.
Matt’s talk focused on how technology and audiences have helped to change and shape culture. And from that discussion, there were some important points for brands, marketers and creative agencies to consider. As creative agencies get better at optimizing content for algorithms, one of the unintended consequences is that content begins to look increasingly similar because more marketers are shaping it in similar ways. This means it’s tougher for brands to stand out and be more distinctive. To give you an example, think about some of the best practices for social: the need for them to be understandable without sound, to use copy supers. Scroll down your feed and you can see it yourself. The adherence to gaming the algorithm has flatted how we tell stories. What does that mean for marketers? To stand out in this environment, we have to find ways of making content seem distinctive and stand out. Merely adhering to best practices puts us in a position where we blend in with the rest of the content around us. The other misconception we should reconsider is attention spans of our audiences. The tendency for marketers is to believe that shorter is better. That attention spans have shrank to the point where people will only spend a few precious seconds listening. That no one will ever pay attention to longer form messages. The truth is, attention hasn’t completed eroded. 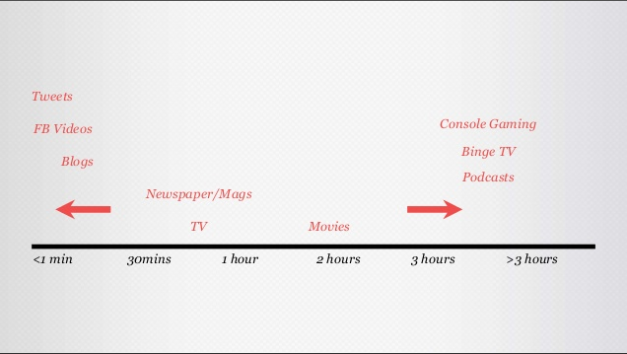 Rather, attention patterns have become more complex. In decades prior, all stories were told in 30-minute to 2-hour increments. Think TV programming, movies and magazines. Now there’s opportunity for content on both ends of the spectrum – content that holds our attention for seconds (tweets, Facebook videos, Snapchats) and content that people can consume for hours at a time (console gaming, Netflix/on-demand binge watching, podcasts). It just has to be worth paying attention to.